The french duo, of Carine Di Vita and Vale Poher, known as “Mensch” will release their double LP in February 2014. The album will revisit 8 songs of their latest project from 2012. 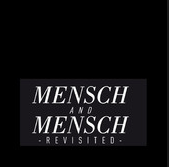 8 artists where invited to rediscover, revisit and reinterpret eight selections in what will be called Mensch Revisited. Cuban pianist Roberto Fonseca, with Julian Urigoitia 08001 band co-produced the theme Evidence. Listen to the song on Spotify. Other featured artists involved in the production were Avan Lava, Yan Wagner, We are Knights, Maissiat, Hypo & EDH among others.